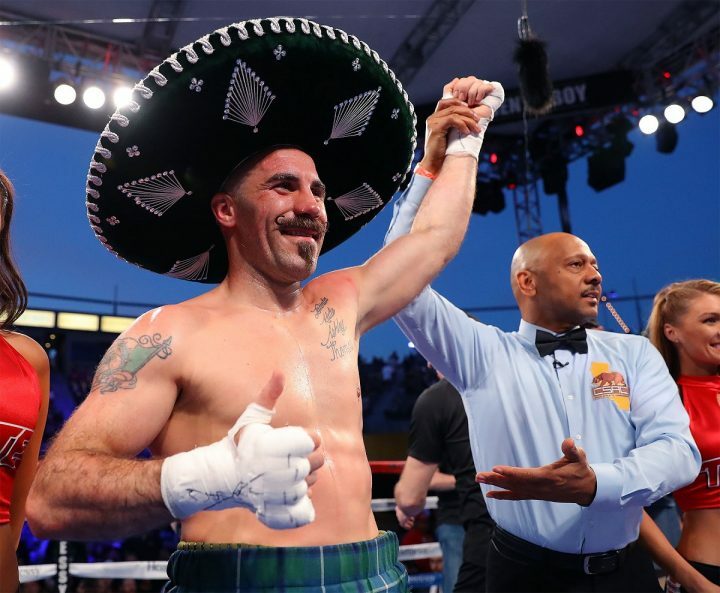 By Sean Jones: Middleweight contender Gary ‘Spike’ O’Sullivan has officially been added to the televised portion of the undercard of the Saul Canelo Alvarez vs. Gennady ‘GGG’ Golovkin undercard on September 15 on HBO pay-per-view at the T-Mobile Arena in Las Vegas, Nevada. O’Sullivan, 33, doesn’t have an opponent picked out, but former IBF 160 lb. champion David Lemieux (39-4, 33 KOs) has already thrown his hat into the ring, saying that he would like to face O’Sullivan (28-2, 20 KOs) on the Canelo-GGG 2 undercard. It would be a good idea for Golden Boy Promotions to pick a live body for O’Sullivan to fight on the Canelo vs. Gennady undercard, because there’s going to be a lot of fans watching the card. O’Sullivan has won his last five fights since being stopped in the 7th round three years ago by Chris Eubank Jr. in 2015. O’Sullivan recently fought on the undercard of featherweight contender Ryan Garcia on May 4th in defeating welterweight Berlin Abreu by a 3rd round knockout. That was a pure showcase fight for O’Sullivan with him being matched against a fighter two divisions below his weight class in Abreu. O’Sullivan looked good against Abreu but the match-making by Golden Boy was atrocious. O’Sullivan should have been fighting someone from the 160 lb. weight class rather than a fighter from the 147 lb. division. Golden Boy Promotions president Eric Gomez is currently working on finding a “big name” for O’Sullivan to fight on the undercard, according to ESPN. But with O’Sullivan being talked about as a future opponent for Canelo, it’s unlikely that Golden Boy will put him in with a risky opponent that could potentially beat him. The same goes for Lemieux. He’s someone that Golden Boy wants to rebuild, it would be a waste if they were to put him in with someone that had a chance of defeating him like O’Sullivan. Lemieux is someone that Golden Boy can plug in with Canelo to make the red-haired star look good in a show case fight. If Canelo gets knocked out by Golovkin on September 15, Golden Boy is going to need to use O’Sullivan or Lemieux as a confidence booster for him. They’re probably not going to risk Canelo’s career by throwing him back into the ring with GGG for a third fight without trying to rebuild his brand by letting him get a victory over O’Sullivan or Lemieux first. Those fighters are useful as tools for Canelo. Even if things work out well for Canelo against GGG, O’Sullivan and Lemieux are still useful as future opponents for him. An ideal opponent for O’Sullivan to fight on the undercard would be WBO middleweight champion Billy Joe Saunders. O’Sullivan is currently rated #4 by the World Boxing Organization. However, it’s unlikely that Saunders, 28, would agree to fight on the undercard of the Canelo-GGG 2 card, even though it would help make a fight between him and the winner of that contest a bigger fight potentially. There might not be enough money for Saunders as well. Further, Saunders already easily beat O’Sullivan many years ago in a one-sided 12 round unanimous decision. Fighting O’Sullivan again would be a pointless thing for Saunders to do at this point because there won’t be much interest from his boxing fans in the UK. If not Saunders, then it’s anyone’s guess who Gomez is looking to match O’Sullivan with for the Canelo-Golovkin 2 undercard on September 15. Given that Golden Boy was willing to match O’Sullivan against a welterweight in his last fight in May, you can’t rule out a repeat of that move. By opening up all lower weight classes to select opponents for O’Sullivan to fight, it increases the chances that they can get a well-known fighter and it also increases the chances that he’ll shine like he did in his last fight against welterweight Abreu. “Let’s go Spike, you wanted to fight me. I’m here. Don’t chicken out. Let’s give the fans a fight for September,” Lemieux said on his Twitter. These guys are strong possibilities for O’Sullivan: Monroe Jr., Centeno Jr. and Arias. All of them are flawed enough for O’Sullivan to get almost a guaranteed win over them. Monroe would be ideal because he can’t punch. Centeno Jr. is a good option because he’s vulnerable to hard punchers. However, he brings a certain amount of danger due to his looping punches. I’m not sure that Golden Boy will want to take a risk of putting him in with O’Sullivan because he might beat him. Arias is a non-puncher, so he has a good chance as well of getting picked by Golden Boy to fight O’Sullivan. Arias can be tricky though, so he might not get the fight. Golovkin vs. Canelo II will be televised on HBO PPV starting at 8:00 p.m. ET/5:00 p.m. PT. With the controversy surrounding the previous fight, it would be a good idea for Golden Boy to stack the card with the best possible opponents to attract the boxing fans who no longer want to see the two fight each other again because they don’t trust the judging. Canelo’s two positive tests for clenbuterol don’t help matters. Golden Boy should match O’Sullivan against the best possible opponent they can find in order to get fans interested enough to pay to see the fight a second time on HBO PPV. It would further help if Golden Boy put featherweight contender Ryan Garcia on the undercard against a good opponent. Garcia will help get fans interested in seeing the card by tweeting constantly in the weeks before the fight.